Influencer marketing offers the ability to harness the power of those who have great influence and further your campaigns. Agencies are pushing this newly hyped marketing tactic like crazy and constantly touting the potential rewards. With big growth there’s a critical element that most agencies have been missing. To prove the value of influencer marketing this must be addressed. The element missing from most influencer marketing agency programs is measurement. Sure, they may be showing the end results of the programs with influencers attached but that’s not enough to prove the value of the added work required for an influencer program. Influencer marketing measurement must show the additional value influencers brought above and beyond what the campaign would have brought without them. So why are most agencies neglecting this important measure? As we can see from the Google Trends graph below, while the topic of “influencer marketing” has grown greatly in the past 2 years (blue), there has been almost zero discussion about “influencer marketing measurement” to go with it (red). Either marketers aren’t sure of how they should measure influencer marketing success or they’re measuring it the same way they measure all other campaigns (which doesn’t show the true ROI) and they certainly aren’t talking about it. 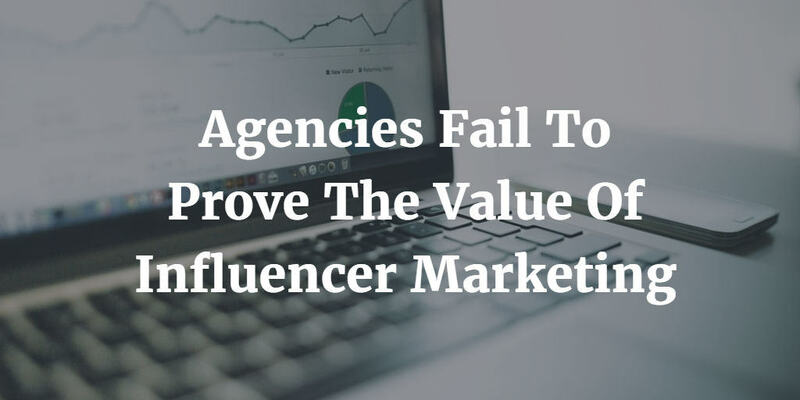 Without proper measurement agencies can’t claim their influencer marketing programs are truly successful. Of the many agencies I’ve talked with about influencer marketing none have really shown an understanding of reporting related to the influencer piece itself. They may be able to report basic KPIs like pageviews or social data but they don’t seem to grasp the fact that those don’t show how influencers boost programs above the levels they’d perform at without those influencers involved. If you can’t show that influencers actually gave lift to a campaign then why should a client pay you more money to integrate influencers? Influencer marketing is awesome and it can produce amazing results but without proper reporting there’s no way to show the real value of the work you’ve done. Think about how your’re reporting on influencer programs and make sure it shows the value influencers bring to your campaigns. To prove the value of influencer marketing is to show why influencer programs are better than other available options. Show your clients why this is the case and your work is sure to grow just like influencers grow your campaign success.